When most kids in Japan go on to middle school, they are required to bring their own lunch. 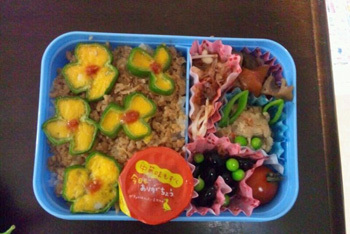 These lunches are called 'bento' s and are usually (of course, there are some exceptions) made by their moms. 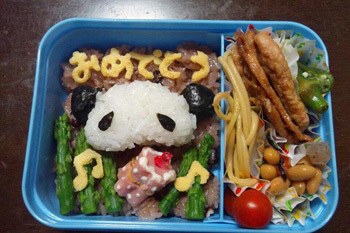 Different from the idea of a typical "lunch box" with a sandwich and pack of crisps on the side, a bento is made to be nutritious and also pleasing to the eye. It is undisputedly a unique Japanese tradition, filled with Japanese culture such as considering food as art, eating a specific type of food on a specific type of day, and eating healthy. I would like to introduce some of my friend's lovely bentos today. Her mother wakes up at 4:45 every day to make her daughter's lunch. They are works of art, created with exceptional care and overflowing love. 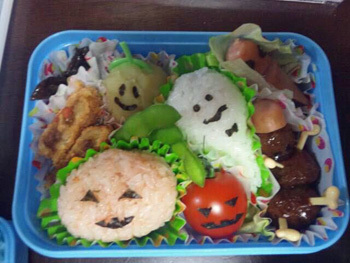 This bento was made for Halloween. Rice balls are shaped to look like ghosts or pumpkins. The color of the orange pumpkin shaped rice ball comes from the salmon flakes that are mixed with the rice beforehand. The black facial parts are created from dry seaweed, a typical Japanese foodstuff. 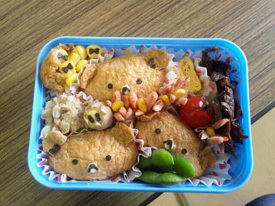 This bento was created for the Japanese annual 'setsubun' day. Setsubun is a day when the Japanese people throw dried beans from the house, outwards -- usually towards their gardens -- to chase away bad luck. When we throw the beans, it is customary to say 'Oni wa soto! (Oni go away!). 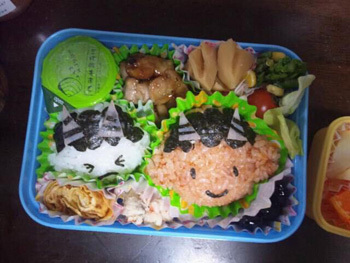 Onis are Japanese goblin-type-demons which can be seen in this bento. This explains why the smaller Oni's face is sad. The orange Oni is made out of ketchup rice. These are just some of the many bentos that my friend carries to school daily. Of course it must be understood that not every parent does this for his or her children. (True, I eat the same lunch everyday; rice, rolled fried eggs, and sausages.) 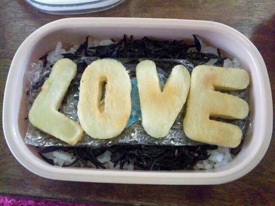 But it can be said that the culture of bentos is truly a sign of overflowing love from the creator to the receiver. Like a letter, it connects and carries the feeling of love onto the ones you care about. Child Research Net would like to thank the Doshisha International Junior/Senior High School, Moe Saito and Ayaka Hirose, student and author, for permitting reproduction of this article on the CRN web site.